The Ohio Bobcats (6-2, 3-1) haven’t had a problem with starting games this season. They have scored on their first possession in six of their seven games this season (sans the Akron matchup). A dissipating running game, however, has almost nulled any of the first-strike efforts by the ‘Cats this season, while the defense has been relied on late in contests to win games for Ohio. But against their rivals, the Miami RedHawks (0-8, 0-4), running back Beau Blankenship ran with a full head of steam consistently throughout the first quarter. Blankenship’s ability to put the Bobcats in position to score quickly with eight first-quarter rushes for 74 yards proved to be the steadying force early on in the Green and White’s 41-16 victory over Miami. Wide receiver Donte Foster, who played a complimentary role to Beau with five catches for 92 yards and two touchdowns in the first quarter, aided quarterback Tyler Tettleton’s hot hand in the blowout victory. Miami was only able to counter Ohio’s two 2:30 touchdown drives with a 45-yard field goal make by RedHawks kicker Kaleb Patterson. Patterson connected on the kick at a windy Peden Stadium one play before safety Xavier Hughes broke up quarterback Austin Boucher’s end-zone attempt. Ohio had the early 14-3 lead with 4:19 to go in the first quarter, but the offense went stone cold on three straight drives. On those drives, the ‘Cats went three-and-out on of them and called eight running plays in relation to five passing plays. 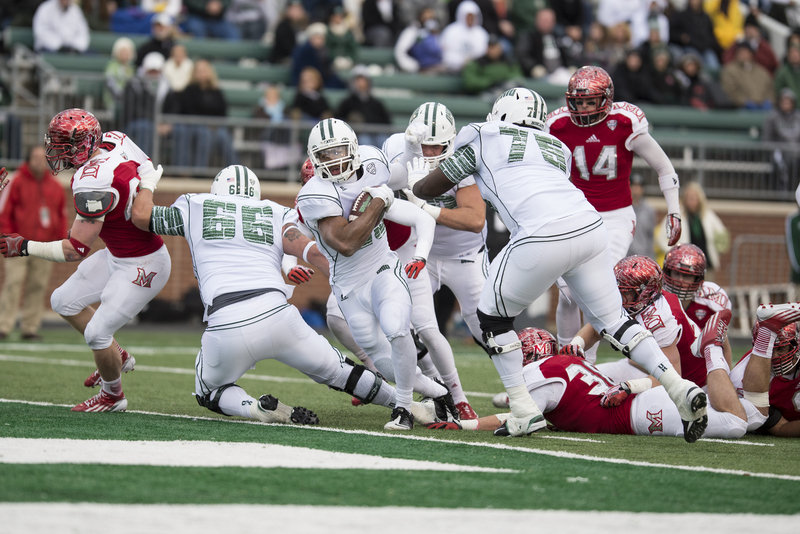 “This time of year you want to make sure that you’ve got your team prepared to play its best and four quarters of really good football,” head coach Frank Solich said. Miami was able to take advantage of Ohio’s sluggish second frame, converting on a fourth-down call that led to a 22-yard second-effort touchdown grab down the middle by RedHawks tight end Dustin White. The score brought Miami within one score with Ohio now only leading by the mark of 14-10 with 6:56 remaining in the half. After a third consecutive drive ending with a Grant Venham punt, the defense stepped up in Miami territory with the game’s first turnover. Redshirt senior defensive back Travis Carrie picked off his first pass of the season at the Miami 31-yard line, setting Ohio up with a swift five-yard fade to wide out Donte Foster. 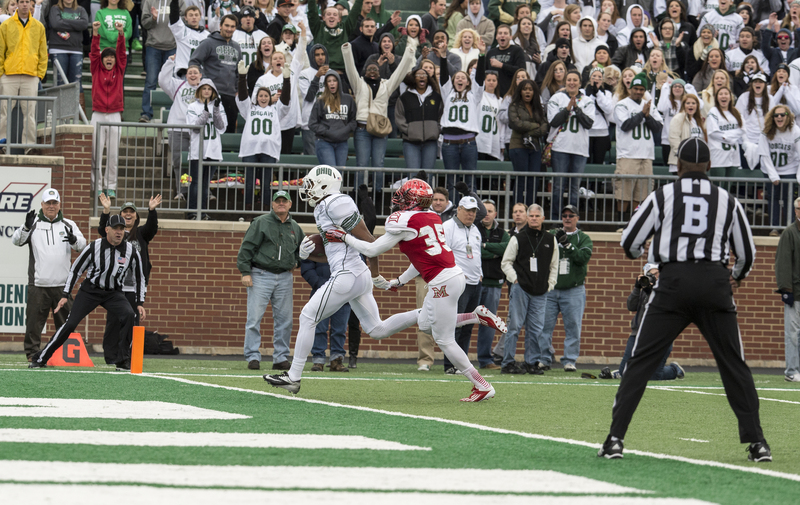 Foster’s third touchdown grab capped off the Ohio wide receiver’s big first half against the RedHawks. Tettleton’s pinpoint precision, good for 22-of-32 for 306 yards and three scores on Saturday, was what fueled the Bobcats’ offensive explosion. Despite stalls in pass-heavy offensive drives, Ohio kept its composure (for the most part) in the win over Miami. The offensive and defensive lines dominated the RedHawks up front all day long, leading to a five-sack effort. On offense, this replicated effort resulted in the ‘Cats’ first 100-yard rusher of the season in Blankenship. Beau carried the ball 20 times for 172 yards. Solich-coached squads, however, have been disciplined on the feel all season long until Saturday. 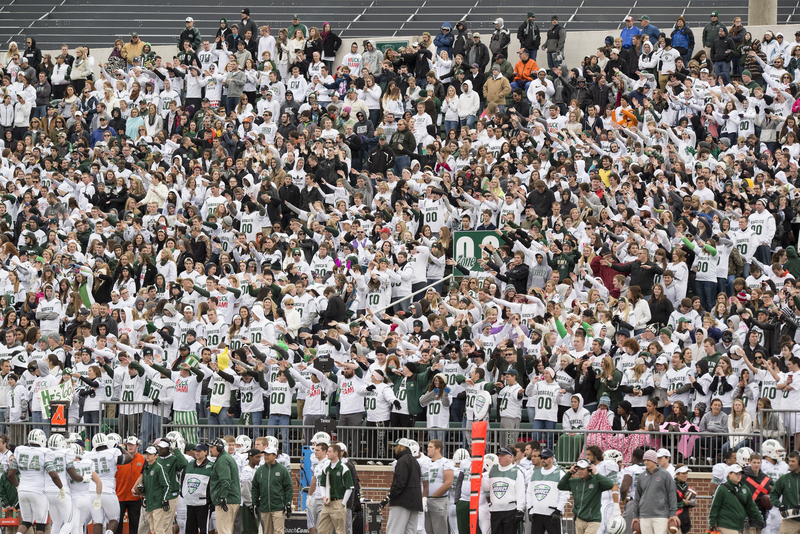 The rivalry loss to Miami last season – one that halted Ohio’s seven-game winning streak to start the season – stung, so the two flags for 24 yards that the Green and White received were well warranted. Sticking with a rushing attack the rest of the way, Ryan Boykin got things going for himself in the second half. On Ohio’s second-most time-consuming scoring drive of the day (4:05), the ‘Cats covered nearly 80 yards in eight plays. Boykin was involved in five of those eight plays, and the Ohio rushing attack compiled a season-high 229 yards. Boykin’s seven-yard score early on in the fourth frame put Ohio ahead of Miami, 34-10, with 13:03 remaining in the game. The ensuing offensive drive saw Ohio substitute its starting quarterback for backup Derrius Vick. On Vick’s first drive, the redshirt sophomore fumbled the ball in Miami territory, creating a mad dash for the ball toward the end zone. The RedHawks recovered at first, and then Ohio forced the ball out of bounds, causing the possession arrow to go Miami’s way. The turnover, Ohio’s first and only for the day, resulted in six points (failed two-point conversion) for the RedHawks thanks to a three-yard rush by third-string quarterback Drew Kummer. Ohio immediately responded with a score of its own on the way to capturing the W in the 90th meeting between the two rivals. A 12-play, 56-yard drive — Ohio’s lengthiest in terms of plays called and time (6:30) – ended with a six-yard Vick touchdown run that sealed Miami’s fate. Ohio will have nine days in between games before they head to Buffalo on Tuesday, Nov. 5 to face off against the Bulls (5-2, 3-0). Kickoff is set for 8 p.m. at University at Buffalo Stadium.